I have often commented on what a small thing the world really is…especially so now with the technological advances that we all now enjoy – and too often take for granted. One such advance (this thing called the Internet) allowed me to learn that the Knapp family has a connection (a tiny one!) to the last empress of Russia -Empress Alexandra Feodorovna Romanova, wife of Nicholas II, the last emperor of Russia. Well, Empress Alexandra wasn’t always a Romanov – nor was she a Russian by birth. In fact, that’s where the connection to the Knapp clan comes into play. 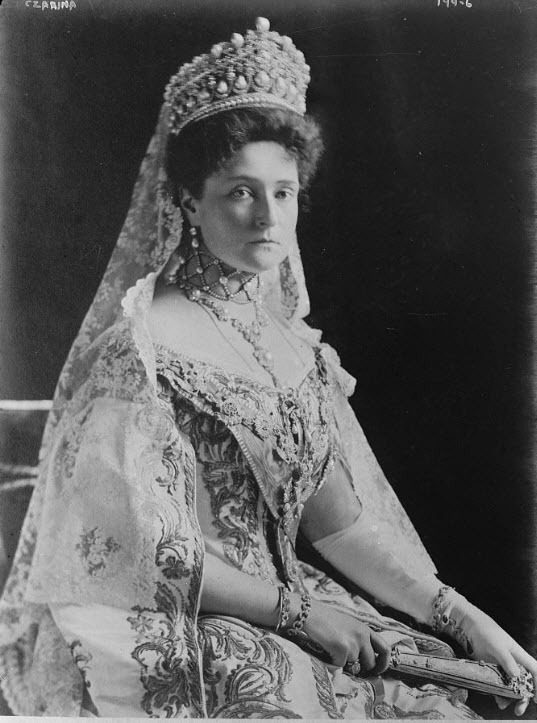 Before Empress Alexandra married Nicholas II, she was Princess Alix of Hesse and by Rhine. She was born on 6 June 1872 at the New Palace in Darmstadt as Princess Alix Viktoria Helena Luise Beatrice of Hesse and by Rhine, a Grand Duchy that was then part of the German Empire. Princess Alix grew up in Hesse-Darmstadt – the same part of Germany where Franz Adam Knapp was born. Franz Adam Knapp left Germany for America in 1831, some 40 years before Alix’s birth. But it was Alix’s grandfather, Louis I, Grand Duke of Hesse, who was the reason for Franz’s departure from Germany. Grand Duke Louis I of Hesse was closely aligned with Napoleon and presided over a large territorial expansion during the Napoleonic wars. Franz Adam had lost at least one brother to war – he left Germany for the freedom of America. I guess he felt he would rather take his chances on the American frontier than wait around for Louis I of Hesse (or his son, Louis II) to conscript him. Princess Alix was the sixth child among the seven children of Grand Duke Louis IV of Hesse and by Rhine, and Princess Alice of the United Kingdom, who was the second daughter of Queen Victoria and Albert, the Prince Consort. Baptized a Lutheran, Alix had some pretty heavy hitters (historically speaking) as her godparents: Prince and Princess of Wales, Tsarevich and Tsarevna of Russia, Princess Beatrice of the U.K., the Duchess of Cambridge and Anna of Prussia. But her lofty connections to European and Russian royalty did her little good against a deadly bacterium. Bacteria don’t care who they infect – whether the victim has a royal title or not matters little – especially before the age of immunizations, antibiotics and modern medical treatment: diphtheria. So when, in December 1878, diphtheria swept through the house of Hesse, Alix, her three sisters and her brother Ernst all fell ill.
Only Elisabeth, Alix’s older sister, who had been sent to visit her paternal grandmother in England, escaped the outbreak. Princess Alice chose to care for her sick children herself rather than let doctors do it. But Alice herself soon fell ill and died on the anniversary of her father, Prince Albert’s on 14 December 1878, when Alix was only six years old. Alix, Victoria, Irene and Ernst survived the epidemic, but sadly, the youngest princess, Princess Marie, did not. Alix went on to meet Grand Duke Nicholas II, heir to the Russian throne, in Russia when Alix went to visit her elder sister, Elisabeth, who had married Nicholas’ uncle, Grand Duke Sergei Alexandrovitch. The couple fell in love and had to overcome a lot of familial resistance in order to marry. Alexandra is also known for being one of the most famous carriers of hemophilia, the blood disease. Her only son and heir to the Russian throne, Alexei, suffered from hemophilia. The Russian people never accepted Alexandra. Her life ended prematurely when she and her entire family were executed in 1918 during the Russian revolution. It was many years before their bodies were discovered, identified and reburied. Alexandra, Nicholas and three daughters were re-interred in the St.Catherine Chapel of the Peter and Paul Cathedral at the Fortress of St.Peter and St.Paul in St. Petersburg in 1998, with much ceremony, on the eightieth anniversary of their execution. In 2000 Alexandra was canonized by the Russian Orthodox Church together with her husband Nicholas II, their children and others including her sister Grand Duchess Elisabeth. This entry was posted in Darmstadt, Hessen and tagged Emperess Alexandra of Russia, Emperor Nicholas II of Russia, Princess Alix of Hesse, Russian Revolution. Bookmark the permalink.